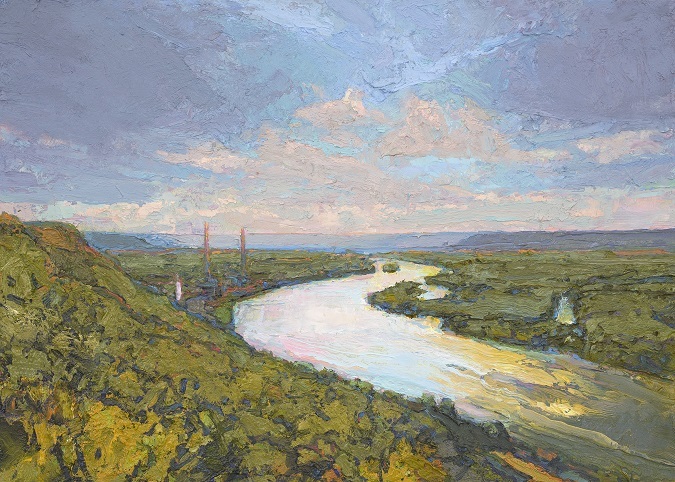 This summer and fall, Tom Paquette had the opportunity to exhibit the paintings he made over the past three years illustrating his travels along the Mississippi, from source to gulf. From April through August, his exhibition titled “America’s River Re-Explored” was on display at Winona’s Minnesota Marine Art Museum. Currently, you can find this exhibition at the Watermark Art Center in Bemidji. It will be on view through October 28, 2018. Next year, from April 27 – July 28, 2019, “America’s River Re-Explored” will make a final stop in Iowa at the Dubuque Museum of Art. The book which accompanies this traveling exhibition is available for sale at Groveland Gallery.